+1 button on search results in English on Google.com - a way for you to recommend content to your friends, contacts and the rest of the world directly from Google search results and ads. Today, 1+’s will start appearing on Google’s search results in Australia for some users, and will start showing for most logged in users by the end of the week. Just like on Google.com, the +1 button allows you to recommend a news article, your favourite brand of sandals or an attraction you visited with a single click. Say, for example, you’re planning a trip to London. If you are searching for a hotel, we may show you +1’s from your globe-trotting friend. Or if you’re looking for things to do on a sunny day, we may show you +1’s from your food-loving cousin next to the result for a gourmet market. But +1s aren’t only for search results. You will also see +1 appear on sites large and small across the Internet. From today, you can +1 local businesses on Truelocal, holiday accommodation at Stayz, vehicles at Mitsubishi, daily deals on Spreets and electronics at Kogan. In the next few days sites like Trading Post, The Australian and News.com.au will also be adding +1 to their sites. Website owners can implement the +1 button on their site within minutes. How do we know which +1’s to show you? We use many signals to identify the most useful recommendations, including the people you are already connected to through Google (your chat buddies and contacts, for example). To get started +1’ing the stuff you want to recommend, you’ll need to create a Google profile. You can use your profile to see all of your +1’s in one place, and delete those you no longer want to recommend. To see +1’s in your Google search results you’ll need to be logged into your Google Account. We believe that +1, combined with all of the social content we’re now including in search globally, will mean even better, more relevant results than you get today. Back in March, we announced the +1 button on search results in English on Google.com - a way for you to recommend content to your friends, contacts and the rest of the world directly from Google search results and ads. Today, 1+’s will start appearing on Google’s search results in Australia for some users, and will start showing for most logged in users by the end of the week. Today Microsoft is launching Office 365. Many of you have asked for our perspective, so we thought we’d share some thoughts to help you make an informed choice. With Apps you can work with multiple people in the same document. There’s no need to worry about whether or not it’s possible to share a spreadsheet, or co-edit a presentation. You can see people type in real time, and share a file in just two clicks. Discussions bring people into your documents for rich conversations. You don’t need to buy additional licenses to work with others, or hope people outside your company have upgraded to the same software. If you have a Google account, you can collaborate. Office 365 is optimised for Windows-based PCs and devices, which reduces your flexibility. Our applications are designed to work well on any device, on any operating system. Desktop, laptop, Chromebook, tablet, smartphone. Windows, Mac, Linux, Android, Blackberry, iOS, Windows Mobile. Edit on the go. Share from anywhere. Start on your computer, move to your tablet, finish on your phone. When the web is the platform, it just works. 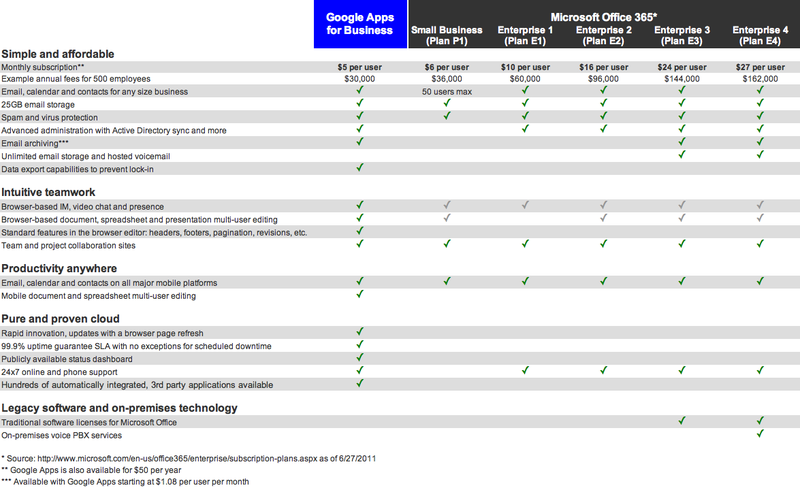 Office 365 is 11 different plans, three editions and two tiers. Apps is $5/month with no commitment. 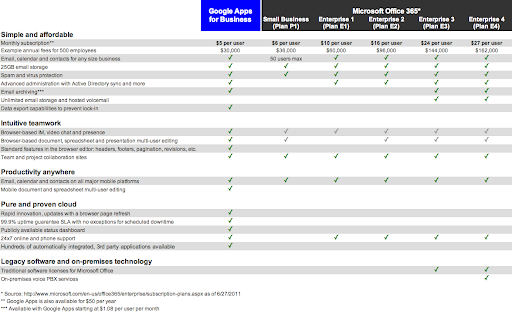 This is a cross-post from the Google Enterprise blog.